For thousands of children across the world, dreaming about what they want to be when they grow up is an everyday occurrence. For some though, their dreams don’t always seem attainable – even when (in reality) they actually are. 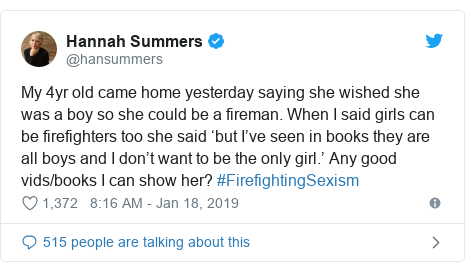 I spotted an example of this recently, where the BBC reported about a little girl who told her mum she wished she was a boy because she wanted to be a firefighter and all of her story books portrayed firefighters as men. This isn’t right, and is something we never want to happen again. After we saw her story, we decided to look at the number of stock images of female firefighters online, and our findings were shocking. We found that less than 10% of stock images of ‘firefighters’ are women, and after looking at a large selection of professions, we found that firefighting was among the worst categories for gender parity. To tackle this, we’ve decided to launch a brand new initiative and use our own professional headshot service to get more female firefighters photographed, and plan to release the images for free through our website. The purpose of this is to encourage female firefighters to step forward and be photographed to improve the gender balance in stock photography. We will be making all the images available for free to try and bridge the huge gap between men and women. Female firefighters? You can register your interest to be involved here. The fact that female firefighters and so many other professions are heavily underrepresented is awful. In this day and age it’s just not acceptable. They are such a huge inspiration to children of both genders - however, if there are little girls out there who think that they need to be a man to be one, then something is clearly wrong. That’s why we think it’s so important to try and strike a balance of men to women when looking at images online, and why we want as many women in the profession to come forward and take part in our photoshoots.